I’m organizing a workshop on the use of social networking in transport at SPUR in San Francisco on Friday November 16, 2012 … from 12:30 to 1:30 (longer if there’s more to discuss). 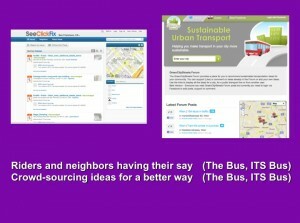 I hope to use the discussion to refine my session proposal for Transportation Camp DC 2013. Here’s the current Social Networking and Transport session proposal (it’s a wiki so feel free to edit with your ideas). Note: the wiki was deleted in 2014, contact me if you’d like to see the information. Andy Nash from GreenCityStreets.com will host a workshop on the use of social applications to improve transport planning and operations. We’ll start by identifying existing applications and then move into brainstorming ideas for creating new and improved applications. We’ll be looking at all transport modes (bikes, public transport, walking, etc.) and focus on identifying opportunities for actually implementing applications. Really great workshop you’re doing here. Wondering if I can invite you to participate in Hack City – Nov. 9-11th at Code for America. One of our challenges deals directly with sustainable mobility — in that we can use #cleanweb as a means for improving transportation here in the Bay Area. The Low Miles Community (LMC) concept seeks to create and sustain low-driving, green communities. 100% of residents in large new residential complexes will pledge to reduce vehicle trips by using alternative modes of transportation, such as carpooling, vanpooling, bicycling, walking, telecommuting, or taking transit. LMCs will use online groupware technology, social marketing, and neighborhood gatherings to facilitate the evolution of a dual physical/cyber culture within these communities. This culture will provide positive social reinforcement and place a high value on a green lifestyle not centered on the private automobile. Each community-of-practice will develop innovative auto-reducing solutions and will share these solutions with other LMCs. LMC behavior change begins with meaningful pledges that are visible/known to the local peer group, changing individual self-perception. Peer pressure further reinforces behavior change and ensures that behavioral norms change permanently. The use of effective persuasion techniques contrasts with soon-forgotten on-line behavior change pledges such as http://green.yahoo.com/pledge/create . Building upon the innovative TravelSmart door-to-door neighborhood driving behavior change program, LMC takes a further step forward by achieving local critical mass. There is more of a focus for suburban communities than urban communities in this concept, as the behavior change potential is greater. Nice. I’ll try to make Wednesday’s workshop in San José!